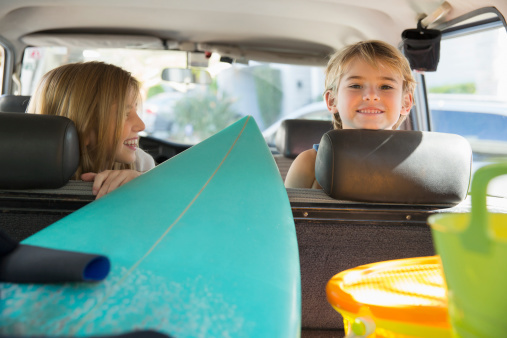 Most families plan vacations to different areas in summer time, during holidays, or on long weekends. Families plan trips to historical places, have picnics in parks, go to beaches, or spend a few days in some other city or country. These fun trips are remembered by families for the rest of their lives, and are a great way to bond as a family. However, travelling with little children in cars, buses or via other means of transport, can be a little hectic. This is because children get bored easily, owing to their high energy levels. You need to plan before your trip on how to entertain them; by using certain tactics, you can end their boredom and their constant questioning of how much time is left before you reach the destination. You should always carry some things which will entertain your kids during the journey. For this purpose you can bring along books so they can read, or colouring materials so they can draw and keep themselves busy. If they do not enjoy such activities, you can bring along toys, like Barbies for girls and hand-held gaming consoles for boys. You can bring music CDs from home and play them in the car, and you can bring CD players or iPods if you are not travelling in your car. Besides music, you can also listen to the radio and let the kids enjoy. The best option is to let the children listen to their favourite songs. You can play different car games with your children like the license plate game or thinking of an animal. You can even let your children sing songs en route to your destination. You can always buy a portable DVD player or install entertainment systems on the rear seat of your car. You can bring DVDs of animated movies, or your children's favourite flicks, and play them in the car. However, you should know that staring at a screen for a long period of time might affect their eyes. Thus, you need to change the activity after a while, and not let them watch movies for too long. You can always bring snacks or other food items with you on your trip. Buy (or make) some sandwiches, fruits, biscuits, and chips, and carry them with you during the journey. In addition to these, you can bring juice boxes and even milkshakes for your children.